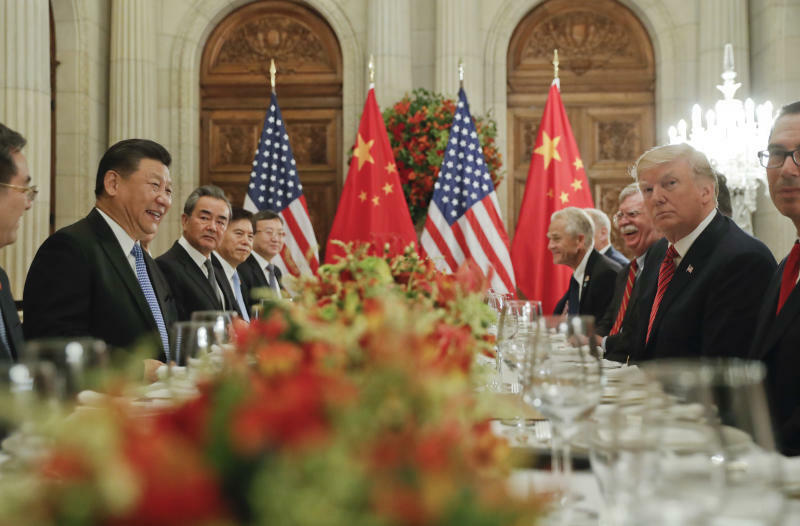 WASHINGTON (AP) — The dinner table diplomacy that Presidents Donald Trump and Xi Jinping of China conducted over the weekend produced something as vague as it was valuable: an agreement to keep talking. Forged over grilled sirloin at the Group of 20 summit Saturday in Buenos Aires, Argentina, the ceasefire Trump and Xi agreed to Saturday night illustrated that the leaders of the world's two largest economies can at least find some common ground, however tentative and ill-defined it might be. The truce pulled the United States and China back from an escalating trade war that was threatening world economic growth and had set global investors on edge. 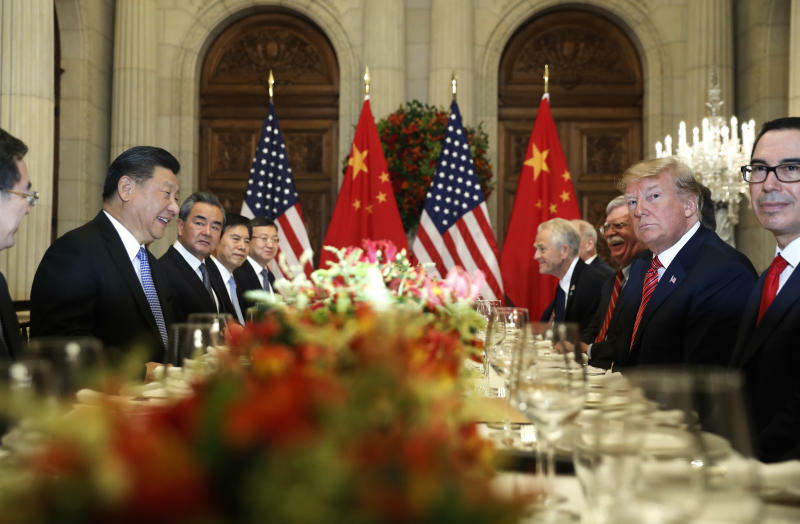 "The prospects for real progress on substantive issues with China are now better than at any point in the Trump administration," said Andy Rothman, investment strategist at Matthews Asia. What Trump and Xi achieved was the gift of additional time — 90 days, at least — to try to resolve the thorny and complicated issues that divide them. Most important among them, and perhaps the most intractable, is the U.S. argument that Beijing has deployed predatory tactics in a headlong drive to overtake America's global supremacy in high technology. Yet reaching a permanent peace will hardly be easy. The Trump administration asserts, and many experts agree, that China systematically steals trade secrets and forces the U.S. and other foreign countries to hand over sensitive technology as the price of admission to the vast Chinese market. This year, Trump imposed an import tax of 25 percent on $50 billion in products, then hit an additional $200 billion worth of goods with 10 percent tariffs. Those 10 percent tariffs were scheduled to ratchet up to 25 percent on Jan. 1 if the United States and China failed to reach an agreement to at least postpone that move. In Buenos Aires, they did reach such an accord. Trump agreed to delay the scheduled U.S. tariff increase for 90 days while the two sides negotiate over the administration's technology-related complaints. 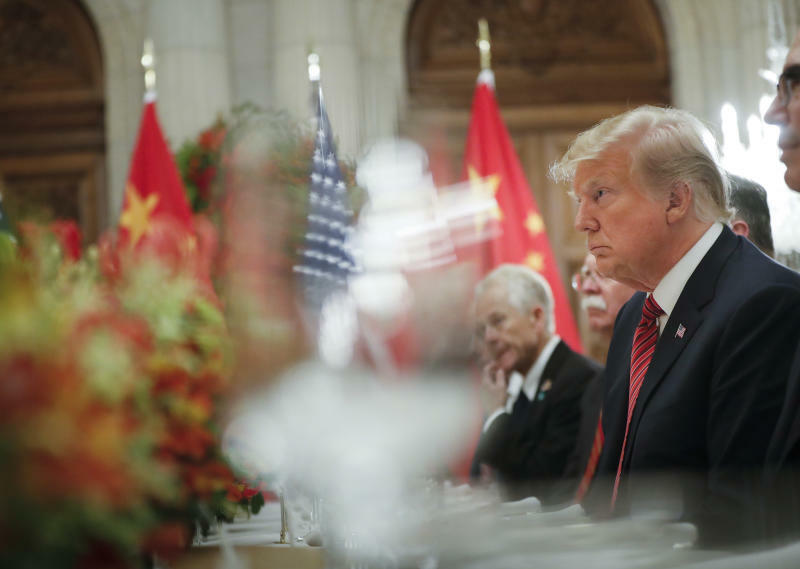 In return, China agreed to buy what the White House called a "not yet agreed upon, but very substantial" amount of U.S. products to help narrow America's gaping trade deficit with China. If the Chinese did eventually increase such purchases, it would be warmly welcomed in the U.S. Farm Belt, where producers of soybeans and other crops have been hurt by Beijing's retaliatory tariffs. Trump tweeted late Sunday that "China has agreed to reduce and remove tariffs on cars coming into China from the U.S. Currently the tariff is 40%." There was no Chinese announcement about possible tariff cuts and the Ministry of Commerce in Beijing didn't immediately respond to questions. Beijing cut import duties on foreign autos to 15 percent in July but added a 25 percent penalty for U.S.-made vehicles the following month in response to Trump's tariff hikes. But can China be trusted? Its contentious tech policies lie at the heart of its economic vision, and Beijing could prove reluctant to sacrifice its ambition, no matter what longer-term agreement with the United States it eventually reaches. "Make no mistake about it: The issues that we have with China are deep structural issues, and you're not going to resolve all of them in 90 days or even 180 days," said Dean Pinkert, a former commissioner on the U.S. International Trade Commission and now a partner at the law firm Hughes Hubbard & Reed. The Trump administration is "going to have to decide how much progress they need in order to define it as a win." Parag Khanna, founder of the FutureMap consultancy and author of the forthcoming book "The Future is Asian," noted that in speeches to domestic Chinese audiences, Xi is still promoting the economic self-reliance that Made in China 2025 symbolizes. "What he's saying to his own people has more long-term validity than what he's saying to Trump over dinner for the sake of everyone saving face," Khanna said. Even so, the Buenos Aires breakthrough may calm investors who worried about financial damage from the trade hostilities. Caterpillar, Ford and other U.S. corporate giants have complained that the higher Trump tariffs, if kept in place, would guarantee higher costs and lower profits. That's one reason the Dow Jones Industrial Average tumbled this fall after hitting a record close Oct. 3. At the opening bell Monday, the first day of trading since the truce was announced, the Dow Jones industrial average surged 400 points, following global markets sharply higher. In the meantime, just as Trump dialed back the drama on one trade front over the weekend, he magnified the tension on another. En route from Buenos Aires on Air Force One, the president told reporters that he would soon notify Congress that he's abandoning the North American Free Trade Agreement. Such a move would force lawmakers to approve the NAFTA replacement he reached Sept. 30 with Canada and Mexico — or have no North American trade bloc at all. The absence of any such bloc would hurt companies that have built supply chains that crisscross the three countries' borders. "This trades one trade uncertainty for another," Diane Swonk, chief economist at Grant Thornton, tweeted. "Policy uncertainty remains unusually high for an economy that on paper should be feeling fat and happy." Prospects in Congress for the new deal — the U.S.-Mexico-Canada Trade Agreement — were complicated by the midterm elections, which left opposition Democrats in control of the U.S. House. Democrats favor provisions of the USMCA that encourage automakers to shift production back to the United States. But they say the deal must do more to protect U.S. workers from low-wage Mexican competition. "The work is not done yet," Democratic Sen. Sherrod Brown of Ohio told CNN's "State of the Union" on Sunday.